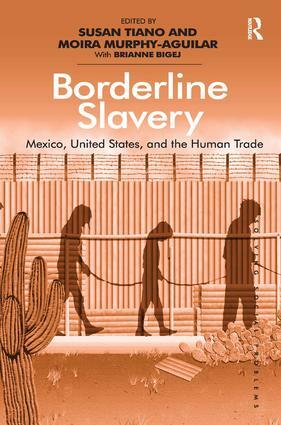 Exploring human trafficking in the US - Mexico borderlands as a regional expression of a pressing global problem, Borderline Slavery sheds light on the contexts and causes of trafficking, offering policy recommendations for addressing it that do justice to border communities' complex circumstances. This book focuses on both sexual and labor trafficking, proceeding thematically from global to regional levels to provide an empirically grounded, theoretically informed, and policy-relevant approach, which examines the problem through the eyes of scholars and researchers from various fields, as well as journalists, public officials, law enforcement personnel, victims' advocates and NGO representatives. Discussing the multinational networks, global economics, and personal motives that fuel a multibillion dollar trade in human beings as cheap labor, Borderline Slavery suggests future directions for effective policies and law enforcement strategies to prevent the advance of human trafficking. As such, it will be of interest to both policy makers and scholars across the social sciences working in the fields of migration, exploitation and trafficking. Susan Tiano is Director of the Latin American and Iberian Institute and Professor of Sociology at the University of New Mexico, USA. She is author of Patriarchy on the Line: Gender, Labor, and Ideology in the Mexican Maquila Industry and co-editor of Women on the United States-Mexico Border: Responses to Change. Moira Murphy-Aguilar worked at the Center for Inter-American and Border Studies at the University of Texas at El Paso and taught in the Latin American and Border Studies Program. Previously she was a Professor of Administration and Social Sciences at Monterrey Tech in Mexico. Her publications include the books Ciudad JuÃ¡rez: Entre la Frontera y el Mundo and EducaciÃ³n e InvestigaciÃ³n: Retos y Oportunidades.